Hello again! It's lovely to sit down and have a catch-up with a good brew. Earl grey tea today I think; trust me, it will go very nicely nicely with the cookies. I sort of made up the recipe as I went, but they turned out to be quite pleasing! Lemon meringue cookies are just the thing if you have a sweet tooth! Doesn't time just zoom by! It's been wonderful to have some free time in the Easter Holiday, but we are now back to school with a vengeance! We had parents evening this week and students are frantically preparing for their exams, and when they work hard, they produce lots of marking. So I think over the next few weeks I'm going to be hunkered down with a red pen and piles of papers. It's worth it though. Did you get a break over Easter? I had a wonderful time and I feel like I'm brimming with stories to tell. I love having the chance to catch up with friends, especially if I can do it over a satisfyingly hefty plate of food. I had so many lovely lunch and dinner dates across London. Exploring the city seems to occupy me more the longer I live here; instead of tiring of the metropolis, I seem to be embracing it further! The boyfriend and I finally managed to see the Book of Mormon, chortling our way through a Wednesday matinee. We embraced the sunshine, having Pimm's aboard the floating pub boat and we dressed up and laughed and danced at the Secret Cinema. I've loved spending time with him, laughing and chatting, curling up with a DVD when it rains despite a sunshiney forecast, and just enjoying each other's company. I also managed to venture out of town a bit and visit my family, stay with some friends, and I caught a train and a boat to visit Dublin! I loved wandering through a new city, and I managed to squeeze in a trip to the theatre to see War Hose - totally incredible. In fact, I've realised that my theatre habit is becoming something of an addiction. It's certainly growing and I fully intend to make the most of it. I'm really looking forward to nice weather and perhaps going to see some shows outside. Do you enjoy the theatre? Can I tempt you with another biscuit? Nobody's counting, so you may as well! 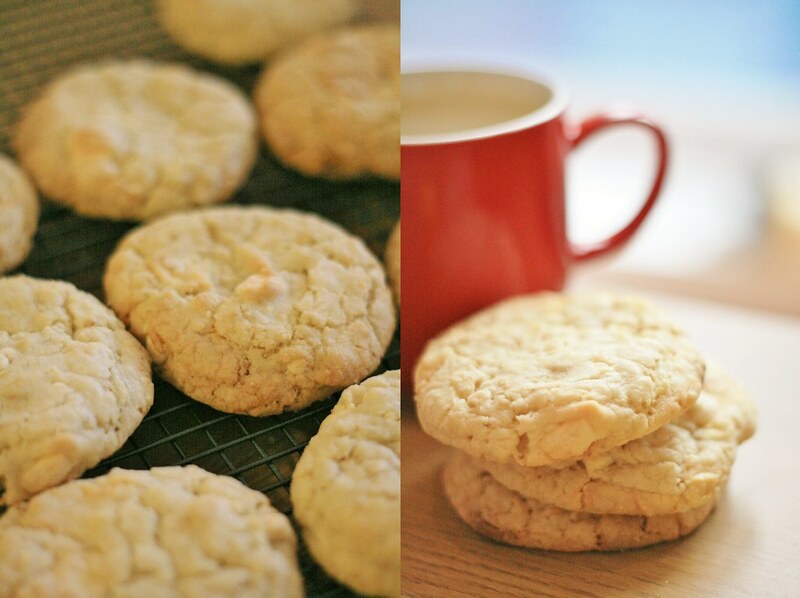 It will keep your cup of tea company; you can't have a cup of tea without a cookie. It's been nice to do some baking in the quieter moments. I've been working on a number of crafty projects which I like to pick up and add a stitch to every now and again. I'm just not feeling the scrapbook at the moment though. I think I need to clear a good long time to really get my stuff out and get some inspiration as I miss doing it even when I don't feel that inspired. Are you working on any projects at the moment? Now head over to the lovely Abi's blog, Creating Paper Dreams. You can drop in and take tea with some lovely bloggers all around the world! P.S. I'm still finding it tricky to find time to scrap. Just not quite feeling it at the moment. I've determined though that at least if I get all my London love out on the blog here, then when I'm ready to pick up the paper trimmer again, my photos and stories will be waiting for me! P.P.S. Went to see a play yesterday as well. See? Addiction. I quite agree with your thoughts about London, although my recent theatre going has been limited to what's suitable for a 7-year-old! Next up? Charlie and the Chocolate Factory. Thanks for having me round; I enjoyed my visit immensely. With lemon meringue cookies I'm finding it hard to leave! Could you share the recipe?! Oooh, since you ask! I'll aim to pop it in a future post! I really enjoyed the Earl Grey and hearing all your Easter 'doings'.....another theatre lover here as well. Do you know, I've never been to a London theatre show, but I'm going to see Les Mis with my best friend in September and I can't wait. Thanks for the catch up and the cookies. Yum! Earl Grey and lemon meringue cookies go wonderful together! Loved visiting you! TSO and I went to the Ballet last summer and decided that was going to be our new addiction. We haven't managed another fix yet - mainly because of the aforementioned revision. But soon.. I think theatre is a perfectly wonderful addiction - I'm jealous! Thanks for the tea, and I'm glad I didn't have the calories from the cookies - they look delish! Ah yes marking and red pens, oddly these days I do almost all of mine via the computer but the revisions in Word are still in red. Glad that you got to go and do fun things over the Easter break. Agreeing also that showing London off is a fun thing to do! Mmmmh, those cookies do look delicious and I'll be checking back for the recipe (especially since we have lemons growing on the patio!) - we are trying to plan a three day trip to London in July but find it hard to find a place to stay that doesn't break the bank... maybe I should ask you for some advice!